Dementia can be caused by a variety of brain disorders, and no two seniors experience identical symptoms. In addition to impacting memory, these illnesses can also affect emotions and motor skills. With an early and accurate diagnosis of dementia, some older adults can minimize the symptoms. Home care Montgomery experts discuss a few warning signs your senior loved one might be developing dementia. Information your loved one has known for years might remain intact during the earliest stages of dementia. Many seniors who have this disorder won’t be able to recall recent information such as the name of a person they met the week before or what they had for breakfast that morning. Just because your loved one remembers old names and dates from years ago doesn’t necessarily mean his or her brain is healthy. Seniors who have difficulty with short-term memory should schedule a memory test with a neurologist or general doctor. If your senior loved one has been diagnosed with a serious condition and needs help with tasks like meal prep, transportation, bathing, and grooming, reach out to Home Care Assistance, a home care provider Montgomery, AL, families can trust. We also offer comprehensive care for seniors with dementia, Alzheimer’s, and Parkinson’s. Repeating the same questions and stories often may seem like a minor annoyance, but this type of behavior should never be taken lightly. When repeating those stories, your loved one might also become confused or have a difficult time recalling certain facts. Quite a few disorders can cause this symptom, and it is important to seek out professional medical assistance for thorough testing. Comprehensive brain imaging is the most accurate way to screen for dementia. Seniors who have dementia might find it difficult to carry out normal daily tasks such as taking a shower or making a healthy meal. Be wary of any sudden changes to your loved one’s hygiene, weight, or overall cleanliness. When these issues aren’t addressed, they can result in a long list of secondary health complications like bed sores and vitamin deficiencies. Even if your loved one doesn’t have dementia, he or she might be developing another mental or emotional disorder. Dementia can also affect the ability to perform daily chores independently, and you may need to hire a dedicated caregiver to help your loved one manage these tasks. If your aging loved one needs occasional help with bathing, grooming, cooking, or other basic household tasks, or if you need time to attend to important personal matters, reach out to Home Care Assistance, a leading provider of live-in and respite care. Montgomery seniors can maintain their independence while living at home with the help of our reliable respite caregivers. Almost everyone who has dementia eventually undergoes behavioral changes. Seniors who used to be cautious and methodical might suddenly act impulsively. Some also become extremely paranoid and feel as if their family and friends are trying to steal from them or harm them in another way. These actions and behaviors can be caused by different types of dementia, including dementia with Lewy bodies (DLB) and Alzheimer’s. Doctors still have quite a bit to learn about how dementia affects other areas of the body besides the brain. A recent study carried out at the University of Washington found that decreases in physical health could be one of the earliest symptoms of dementia. Issues such as poor balance and gait slowing are extremely common among seniors with dementia. Luckily, some physical symptoms can be minimized with the proper diet, prescription medication, and a good exercise routine. Dementia can affect almost every part of the brain, including the receptors that respond to the natural chemicals and hormones the body produces. When those receptors are damaged, it can result in emotional issues like apathy and chronic depression. 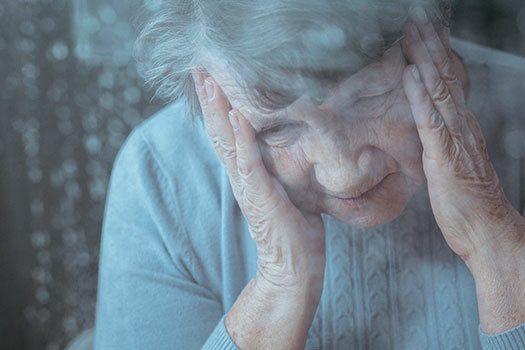 Experts from the Alzheimer’s Association believe that just over 40 percent of all seniors with dementia will develop severe depression at some point. Lethargy, social withdrawal, and impaired thinking are all common signs of depression. A dementia diagnosis can be difficult for seniors and their families to face. If you need help caring for your aging loved one while he or she manages the challenges of dementia, turn to Home Care Assistance of Montgomery. Dementia care isn’t the only thing we specialize in. All of our hourly and live-in caregivers are also trained to assist seniors during stroke recovery and help those living with Alzheimer’s and Parkinson’s maintain a higher quality of life. Call us at (334) 593-3988 to schedule a free in-home consultation.